Visible Ink Press : Which superhero got his start as an action figure, rather than as a comic book character? Which superhero got his start as an action figure, rather than as a comic book character? His nemesis is Dr. Evil. His alter ego was Clive Arno. His sidekick was Action Boy. Captain Action, the original superhero action figure, owes his existence to Barbie. When Mattel premiered its dress-up doll in 1959, it also launched the "razor/razor blade" concept: marketing a host item (the "razor," or the Barbie doll), with supplemental accessories (the "razor blades," or Barbie's clothing). Barbie's rampant success inspired toy makers Stanley Weston and Larry Reiner to attempt a similar product for boys, the result being Hasbro's GI Joe, a generic military figure complemented by an escalating line of combat garb and gear. 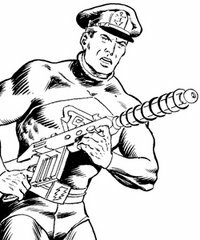 GI Joe so took the nation by storm in 1964 that Weston and Reiner repackaged their idea in a superhero context, knocking on the door of Reiner's employer, Ideal Toys. And so Captain Action, a twelve-inch superhero figure, with additional crime-fighting costumes (all sold separately), was launched in 1966. The original line of Captain Action uniforms consisted of Superman, Batman, Aquaman, Captain America, Sgt. Fury, Flash Gordon, the Phantom, Steve Canyon, and the Lone Ranger, popular characters representing five different licensors, a concerted effort that seems impossible in today's competitive market. Solid sales, bolstered by a ubiquitous advertising campaign on television and in comic books, sparked an increase of product in 1967, including more costumes (with the popular Spider-Man joining the line, along with other heroes), play sets, and accessories, plus the sidekick Action Boy, also marketed with additional uniforms (Robin, Superboy, and Aqualad). Captain Action was merchandized outside of Ideal's figure line, with a card game, an inflatable swim ring, and a Halloween costume. Captain Action sales began to shrink in 1967, but not so much that Ideal abandoned the concept. In 1968, the company issued Captain Action and Action Boy in redesigned packaging and added a villain, the blue-skinned alien Dr. Evil (not to be confused with the character from the Austin Powers movies). DC Comics published five issues of a Captain Action comic book beginning in 1968, illustrated by Wally Wood and Gil Kane, marking the first toy-inspired comic book (over time, Hot Wheels, The Micronauts, Rom: Spaceknight, and others would follow, including, coincidentally, Barbie and GI Joe). Writer Jim Shooter, in Captain Action #1, created a true identity for Captain Action--Clive Arno (note the initials)--and provided him with a host of powers from coins imbued with the abilities of ancient gods. These efforts came too late: Captain Action toys and comics disappeared in 1969. Yet Captain Action maintained a loyal collectors' audience. In 1995, Karl Art Publishing obtained the Captain Action copyright through the publication of a one-shot comic book. Playing Mantis, a producer of reissued baby-boomer toys, acquired the action-figure license in 1998. Captain Action and Dr. Evil reappeared, along with costumes of classic heroes and villains. Even Action Boy returned, renamed "Kid Action" due to copyright restrictions. But publishers DC and Marvel refused to grant licenses for their characters, and without the identifiable Batman, Spider-Man, and the like to support the line, Captain Action was canceled once again in 2000. While his two leases on life have failed to make him famous, Captain Action remains a nostalgic favorite, and a book celebrating his history, Captain Action: The Original Super-Hero Action Figure, was published in 2002. As of 2005, Captain Action Enterprises controls the licensing rights to the character, and has been producing Captain Action toys, trading cards, statues, and other collectibles. Moonstone Books began publishing the new Captain Action comic book series in 2008.